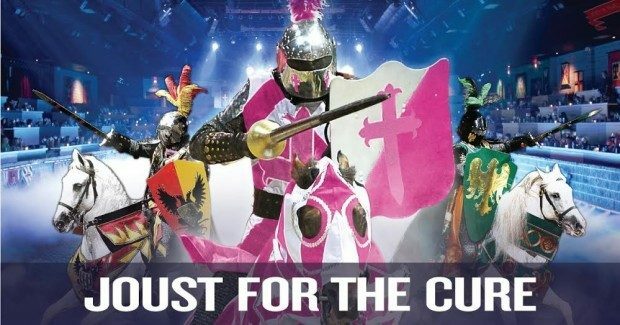 JOUST FOR THE CURE: Medieval Times Discount And Benefit For Susan G. Komen Dallas®! You are here: Home / Dallas/Fort Worth Events / Medieval Times Discount And Benefit For Susan G. Komen Dallas®! Medieval Times Discount And Benefit For Susan G. Komen Dallas®! You can experience the excitement of Medieval Times, right now for just $35 and help the Susan G. Komen foundation in the process! A Four-course feast awaits as you watch the pageantry and thrills of an authentic medieval tournament come to life inside the walls of the King’s 11th Century Style Castle. Six armor-clad Knights of the realm compete in thrilling games on horseback as the pageant unfolds and cheers of the King’s noble guests fill the arena. Skill and strength are measured in the combat. Discover which of the Knights shall become champion. $5 of every ticket purchased via the “Get Yours” button below will be donated to Susan G. Komen Dallas®. This $35 offer is valid for any Sunday through Thursday show thru December 31th, 2015. Tickets must be purchased by December 31, 2015. Offer only valid online.